Jon Huntsman showed up on "The Tonight Show" to discuss the future of his party while his former Republican rivals for the presidential nod were waiting as results trickled in for the Missouri, Minnesota and Colorado races. 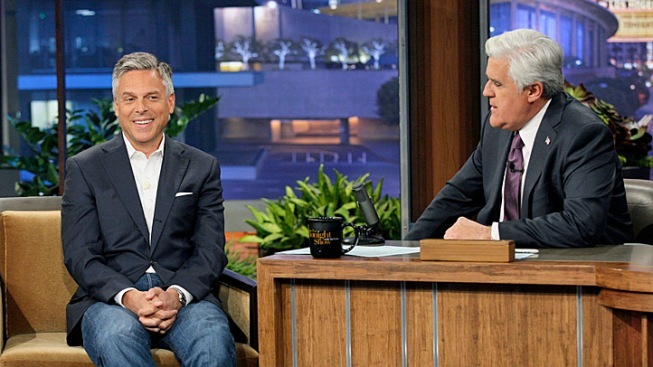 As Republican election results to trickle in Tuesday night, former candidate Jon Huntsman talked the future of the GOP with Jay Leno in a singularly unfunny appearance on "The Tonight Show" — and gave a hint he may run for office again. Leno introduced the former Utah governor, whose campaign was perhaps doomed by perceptions that he was too moderate, with a defeated compliment: "He's a former governor, created jobs, was ambassador to China, honest, kind, ethical, good husband, good father… He never stood a chance!" When Huntsman himself sat down to talk politics, he gave a sober assessment of the state of his party — in stark contrast to his piano jam with the CBS Orchestra on "The Late Show" last year. "I think this kind of churning, this kind of debate, is actually very good for the party. Because the party I'm not sure knows where it is," he told Leno. As for the actual GOP debates, he slammed what he said was the scripted nature of "those stupid debates," likening them to "an expanded reality show," and recalled how he'd said "hell no" to Donald Trump's proposed debate. "We're drawing from a broad literature of successes. We forget that there's some history to the Republican party," he said, citing President Abraham Lincoln's commitment to civil rights and President Theodore Roosevelt's devotion to environmental conservation. He said he rued the extreme partisanship in Washington. "I'm also convinced that we're at a point in time when we're likely to see a third party movement that is very significant in the years to come, because duopolies can only last for so long," he continued. Later in the interview, Huntsman shied away from saying he wouldn't run for president again. Could a third-party run be in his own future, too? Check the clip and see.